Besides conversations recorded by others, Brother Lawrence also connected with friends via letter. Some of these have been included in the book, The Practice of the Presence of God. Below is the essence of his sixth letter, and responses that come to my mind. * The process of concentrating our souls on God will require self-sacrifice and the laying aside of certain pleasures that, while good in themselves, interfere with our devotion to God. * How often is my devotional time a race to read a certain number of chapters and pray for the people on my list so I can go on to other things? How often do I miss any true devotion to God during my quiet time? * I find it amazing that God wants so much to be in relationship with us. To walk and talk with us. To bless and guide us. Why do we—more specifically, why do I—so often put Him off? Besides conversations recorded by others, Brother Lawrence also connected with friends via letters. Some of these have been included in the book, The Practice of the Presence of God. Below is the essence of his fifth letter, and responses that come to my mind. * Firmly resolve to be wholly devoted to God. * If you continually practice the presence of God, you will soon become spiritual. * The first step to practicing the presence of God is to empty your heart of all else. This is what God requires in order to work in your life. * Practice of the presence of God involves a continual conversation with Him. * This continual conversation with God is sweet and delightful, but we do not seek devotion to God for the pleasure it will give us. We do it because of love. * The delight in God’s presence can’t be adequately explained to those who haven’t experienced it. * We often have no idea how much we need God’s grace and assistance in our lives. * Commit yourself now, never lose sight of Him, “spend the rest of your days in His sacred presence,” even if this commitment requires great sacrifice. * We have to want to commit to spending my time in the presence of the Lord. We may see the need, the necessity, the comfort and delight, but still avoid the commitment. Why? Note the “I” in each of these hesitations. Brother Lawrence has continually encouraged us to think on Christ, not on ourselves. Our society influences us strongly in favor of self. It’s a hard habit to break, but that’s the only way we’ll ever make the commitment to practice the presence of God. * We may have a misconception of the purpose of life. As a very old song states: “It’s a battlefield, brother, not a recreation room.” Yes, God blesses us and wants us to enjoy His blessings, but those are bonuses. This life is short and I need to continually focus on what’s important. * Those brief soul-bursting insights into close companionship with God—I call them glimpses of Glory—should overwhelm us and inspire us to practice His presence daily, hourly. Yet we give up so many opportunities of walking closely with Him. * We may forget how very much our Father loves us, and how much He wants us to return that love. But there’s always a new starting point. That would be now. * We often forge ahead on our own instead of seeking and accepting help from Almighty God. His ways are not our ways (Isaiah 55:8), but He always has our best interests in mind. Besides conversations recorded by others, Brother Lawrence also connected with friends via letters. Some of these have been included in the book, The Practice of the Presence of God. The following are thoughts gleaned from the second letter. Thoughts of death, judgment, hell, heaven and our sins remind us of our insufficiency. God is our King. And yet this King “embraces us with love, in spite of our many sins,” because he is full of mercy and goodness. God treats me as his favorite. My father passed away at the age of 76, and we—Mom, my older brother, my younger sister and I—felt a strong sense of loss and grief, as well as joy that he had moved so gently into eternity. On one of the surreal days between Dad’s death and his funeral, my brother took me aside. What a legacy of love my father left us. Even though he had only come to know the Lord personally later in life, Dad’s love was a picture of God’s love for me. I am His favorite. You are His favorite. We need to be real before God, to recognize our failures, shortcomings, sins, and to think on them. Our hearts can be filled with thankfulness that in spite of our sins, the Lord God loves us and opens His arms to us. Remember the story of the prodigal son. Practicing continual communion with God results in peace, joy and contentment. I think if we live in this way, we have great influence on the people around us. The blessings overflow. These thoughts remind me of a song. Give a listen, if you wish. The first letter was apparently written to the prioress of one of the Carmelite convents nearby. A habitual sense of God’s presence is a gift from the Lord. We see ourselves as poor criminals, and God as both Judge and Father. – natural and habitual awareness of God’s presence. Prayer is not only for specific times and places, but a constant, continual connection with God. Sometimes these concepts sound simple, since they are simply framed. But, as Br. Lawrence reminds us, “I found no small pain in this exercise.” Am I willing to take pains to become wholly God’s? Am I willing to renounce everything that is not God? How attached am I to this world? Yet I long for holy freedom, familiarity with God and a natural awareness of His presence. Seems to me the choice is plain, if not simple. What will we lose and what will we gain when we make this choice? 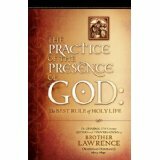 This is the 4th “first-Tuesday-of-the-month” post in the series on The Practice of the Presence of God: The Best Rule of Holy Life by Brother Lawrence (1605-1691). This little book profoundly impressed me with its simplicity and encouragement. The substance of religion is faith, hope and love, the practice of which unites us to God’s will. Prayer is simply sensing God’s presence. We must realize our utter worthlessness, accept that trouble is common to man, and become dependent completely on God alone. The best way to draw near to God is by doing our daily tasks, whether large or small, to please Him (not others). I strive to prove my faith by my works instead of separating faith and works. Paul says that’s organic religion. In this fourth conversation, Brother Lawrence condenses religion to three simple concepts: faith, hope and love (charity). He suggests that it makes no difference what task or vocation or occupation we apply ourselves to, but that we do it for Christ. Surely this should remove competition between Christians. But does it? We take pride in our works, when they mean nothing to God. We try to appear godly, when God is looking not on the outward person but on the heart. Life would be much simpler if each of us were to commit ourselves to following God in our “corner of the world” instead of trying to do more, or better, or more noticeable things for Him.